Not only was today’s theme suggested by Steve Weyer, but he also supplied an extensive list specific song suggestions. Recently teaching a class at OLLI (Osher Lifelong Learning Institute) focused specifically on crosswords, Steve has had the opportunity to explore the history of this subject in the musical arena. You can learn more about the songs on his website on the history, milestones and music page. Steve and I had a chance to sit down and discuss the range of interesting issues related to this subject. I recorded the talk and used a good number of the clips for this Maya’s Mix show. After hearing today’s show, I bet you’ll feel inspired to sit down and have some fun with a puzzle! Today is April 15th. What does this date normally conjure up for you? You got it — taxes! I had no idea until this week that there are actually a bunch of awesome songs that reference this topic (and related issues). This year, 2011, there is an extension, which means that taxes are not actually due until Monday. So if you happen to be a procrastinator like me, you’ll now have a perfect audio backdrop to hear while you go through the delightful experience of filing your taxes. Nothinâ€™ on You â€“ B.o.B. What games do you like to play? Today’s show features songs that mention the following games: poker, Life, Monopoly, twenty one, chess, Twister, Risk, simon says, pretend, hide and seek, ballgame, croquet, Russian roulette, crosswords, Parcheesi, charades, scavenger hunt, Queen of the Nile, gambling, crap shoot and dice. 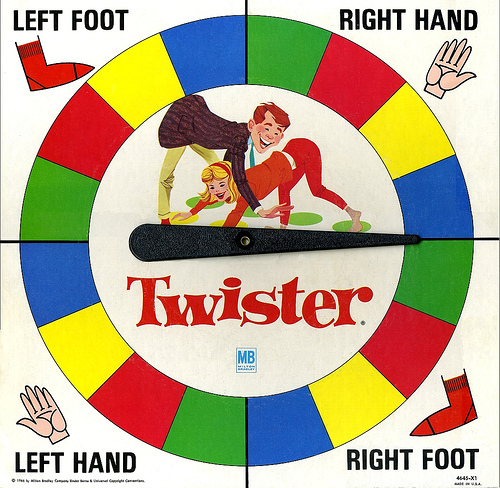 We also get to hear about the crying game, mind games, computer games, wicked games, parlor games, and the circle game.